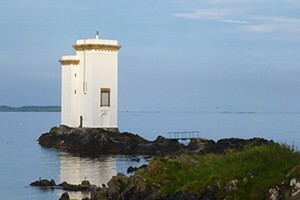 A luxury holiday rental cottage situated next to Carraig Fhada lighthouse, overlooking Kilnaughton Bay on the beautiful island of Islay, part of the Inner Hebrides in Scotland. Fall asleep to the sound of waves lapping at the shore. Recline in the luxurious sitting room and watch otters fishing in the turquoise sea. 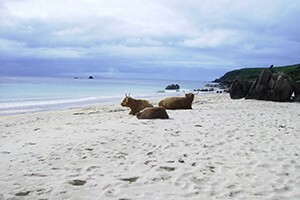 A light, tastefully furnished and comfortable cottage, ideally placed for exploring the beautiful island of Islay. WIFI available. Barnacle Cottage was designed by Hebridean Homes of Skye and constructed by an Islay builder in 2013. The house has the dimensions of a traditional Scottish croft, combined with the latest technological advances in terms of structural materials, insulation and window design. 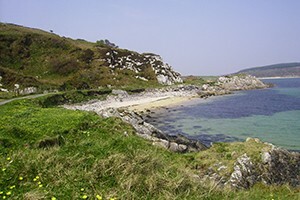 Barnacle Cottage has its own short stretch of rocky coastline. 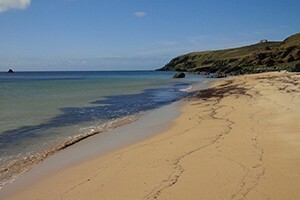 There is also a sheltered sandy cove just a few metres away, with many flat stones for skimming, and the picturesque Singing Sands are behind the cottage on the other side of the headland. The cottage is situated next to Carraig Fhada Lighthouse, one of Islay’s iconic landmarks and a film location for BBC Winterwatch 2018. 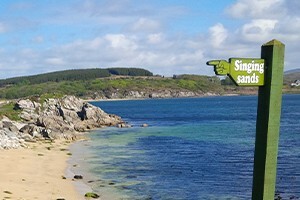 The ferry terminal at Port Ellen is a five minute drive away and the ferries pass in front of the cottage on their way into harbour. Laphroaig distillery is just visible from the living room window and Lagavulin and Ardbeg distilleries are a short distance beyond that. 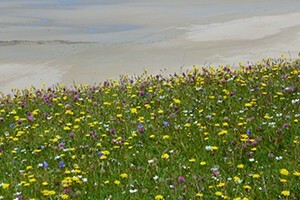 The long straight ‘Low Road’ to Bowmore means that there is easy access to all Islay’s attractions from Barnacle Cottage. © 2014 Barnacle Cottage. All rights reserved.